"Upside Down" on paper sounds to be one amazing experience. One that molds real science, science fiction and romance into one awesome package. Unfortunately, the end result is very far from that hype. While the film is breathtaking visually (with visuals and vistas like no other) and the premise extremely fresh, the execution feels flat, dull and even mediocre at times. Minus the endless loopholes and the heavy lean towards love, the film could have and should have been a juggernaut. In an alternate universe, two planets have a very unique quality than any system known - dual gravity. This means that the two planets live next to each other creating an upper and lower portion. There are also 3 basic rules of gravity. First, all matter is pulled by the gravity of the world that it comes from, and not the other. Second, an object's weight can be offset by matter from the opposite world (called inverse matter). And third, after some time in contact, matter in contact with inverse matter burns. The upper portion is rich and prosperous while the lower portion is poor. Adam, who lives in an orphanage, is from Down Below. One day, he visits his Aunt Becky and discovers about the peculiar properties of the pink bee - an animal which can gather pollen from both Up and Down Below and the one that makes her aunt's pancakes fly. As a child, Adam also visits the top of the Sage Mountain whom which he meets a girl named Eve. Both fall in love but as fate would have it, both are discovered and Eden is dropped by Adam to her planet. He assumes she died and he and his Aunt are arrested. Ten years later, Adam (Jim Sturgess)is trying to create an anti-gravity cream (based on the pink bees recipe) that he will use for face lifts. While watching a game show on TV, he sees Eden (Kirsten Dunst) and finds out she is alive and working at Transworld. He decides that he must do everything to bring her soul mate back - even if it means creating a ripple between the two worlds. While we couldn't deny that "Upside Down" has one unique and interesting premise, the final product is disappointing at best. The biggest no-no we felt for the film were the loopholes that occurred countless times. We know this is an alternate universe but the film did set three basic rules from the get-go and at times, it feels as though they forgot that these rules exist. Without divulging much, we noticed how characters may contradict what they say against what actually happens on the next scene/s. In connection with this observation, we also felt that the film focused too much on romance leaving the science fiction portion severely lacking. As for the acting, we felt that Jim Sturgess and Kirsten Dunst did well but Jim Sturgess needs to improve his narrative skills. 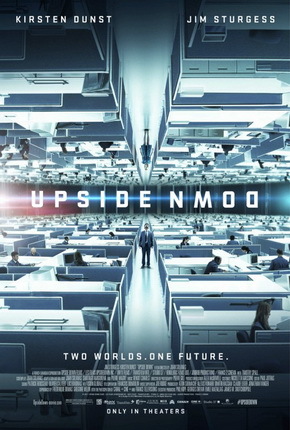 The only thing that stood out in "Upside Down" are its visual effects. The film brought to life a reality that's seems impossible and made it look and feel authentic and tangible. In the end, "Upside Down" lacks the science punch to be really effective. The romance portion was okay but the jarring effects of the loopholes ruin the experience.